With relentless form over the past 18 months blowing away all domestic opponents, Bayern Munich’s main challenges at the moment are as much historical as contemporary – like the rewriting of five decades of Bundesliga statistical records. One of the most significant came with victory at Hoffenheim in early November, Bayern’s 36th successive Bundesliga game without defeat which matched Hamburg’s 30-year-old record. It was little surprise when the following week Pep Guardiola’s team breezed past Augsburg to set a new benchmark. BTLM decided to look in more detail at the parallels between those unbeaten runs of Hamburg (1982 to 83) and the current Bayern side. A glance at the histories of Real Sociedad and Vicenza suggest that while long unbeaten runs don’t automatically lead to trophy wins, they play a big part in helping a team in the right direction. Being unbeatable for long periods was certainly the main catalyst for both these German sides: Bayern are current Bundesliga champions and look likely to retain their title this year, just as Hamburg won both Bundesliga titles in the seasons spanning their unbeaten run. That domestic omnipotence extended into the European arena for both teams too. Bayern are, of course, the current European champions and are short-odds favourites to win the Champions League again next May; Hamburg were themselves beaten finalists in the 1982 UEFA Cup and European Cup winners in 1983. A detailed breakdown of both unbeaten runs emphasises just quite how imperious Bayern’s recent record has been. 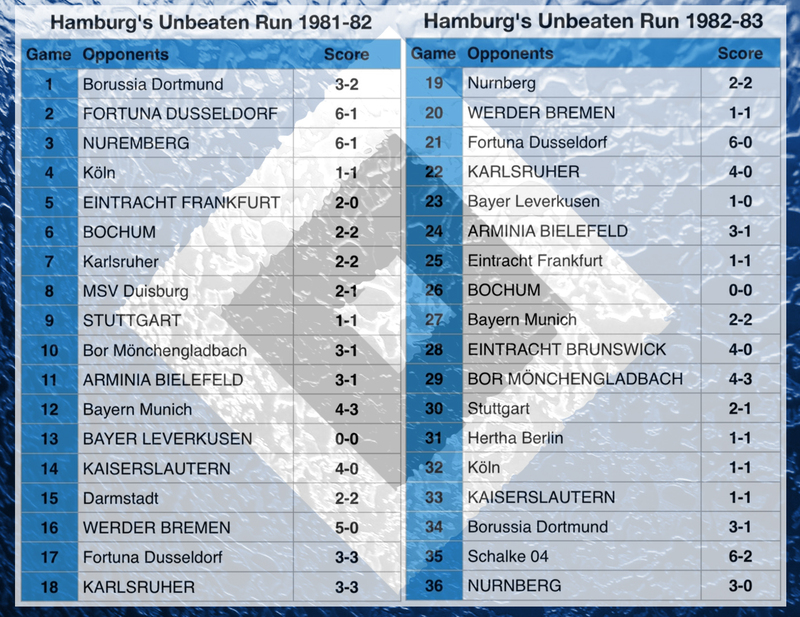 The Bavarians won 30 of those 36 games while Hamburg’s record was rather more modest and entailed drawing almost as many as they won. Surprising given those statistics and the free-scoring reputation of this Bayern team under Heynckes and Guardiola, Hamburg scored a dozen more goals in the same period. Their goal difference is slightly better too. Hamburg achieved their record without the advantage of a huge squad packed with world-class internationals like modern-day Bayern. This was a team assembled at modest cost that burned very brightly for a couple of seasons under the canny stewardship of Ernst Happel. While a late-career Franz Beckenbauer played in the early months of the run, Hamburg’s success was mainly built around a quintet of powerful, all-action veterans: defenders Manni Kaltz and Ditmar Jakobs; midfielders Felix Magath and Jimmy Hartwig and giant centre-forward Horst ‘the header monster’ Hrubesch. This core group was complemented by the Danish striker Lars Bastrup and an impressive group of emerging younger German players in midfielder Wolfgang Rolff, wide man Jürgen Milewski, sweeper Holger Hieronymus and forward Thomas Van Heesen. Thanks to good fortune with injuries this was a side that could maintain a consistent line-up and that continuity helped forge a formidably strong understanding and togetherness . Hamburg’s 36 game run started in January 1982 and lasted for a calendar year through to the January of the following year. There was a certain symmetry to the figures behind it with 18 of its games coming in the second-half of the 1981-82 season and the other 18 in the first-half of 1982-83. The results were identical too with ten wins and eight draws recorded in each half of the run. Trailing 2-0 in Dortmund after 45 minutes in what would be the opening game of the sequence, any suggestion that Happel’s team were set to become such indefatigable opponents seemed fanciful, yet Hamburg scored three times in the second half to win 3-2 and they were off and running. Away matches at Frankfurt and Hertha Berlin were rescued with equalisers coming in the last ten minutes, but only on one occasion was their run genuinely threatened. Happel’s side visited Bayern Munich in April 1982 and trailed 3-1 midway through the second half, however it was typical of the players’ fitness, spirit and resilience that Hamburg would score three times in the remaining 20 minutes to give them a valuable win and chalk up their 12th unbeaten fixture. The toughest looking fixture that Hamburg faced was the one that ultimately brought their run to an end. That 37th game took them to fellow title-chasers Werder Bremen who were themselves in great form in large part because of a young Rudi Völler tearing up Bundesliga defences at will. Völler opened the scoring as Bremen raced into a two-goal half-time lead. 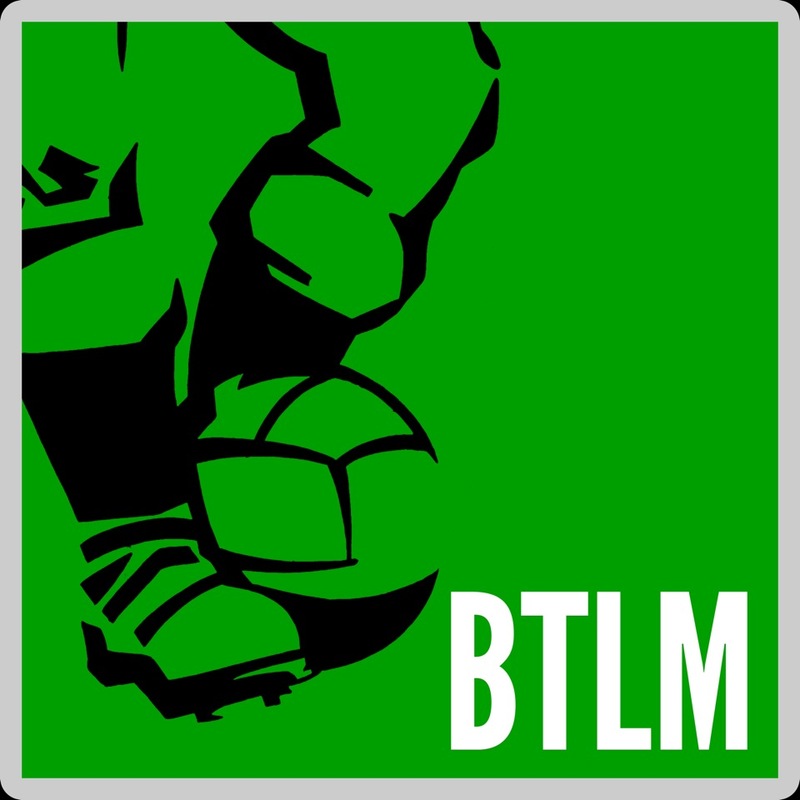 Hamburg battled back in the second half but Benno Möhlmann – a future Hamburg trainer – scored the decisive goal in a hard-fought 3-2 win for the home team. Hamburg at least had the last laugh when they edged out Bremen for the title on goal difference several months later. Football can be a fickle mistress. Two Bundesliga titles, a European Cup win and a UEFA Cup Final all within a 24 month period; one DFB-Pokal win in the miserable three decades since. And to add insult to injury, one of Hamburg’s solitary remaining claims-to-fame has now been bettered, seemingly like everything else in German football, by Pep Guardiola’s Bayern Munich steamroller.